I, like people the world over, heard about Lilly when she had her accident and have been an avid fan ever since. However, Lilly’s heart and good nature was always apart of her and proves what a wonderful companion pit bulls can be. Beyond that, the love that she gives is an inspiration to all of us (dogs and humans alike) to be better than what we are and to be a positive force to the world around us. I saw Lilly’s story on the news and was so touched by her bravery and loyalty. She won my heart along with thousands of others across the world. I even had the pleasure of meeting her! David was nice enough to bring her by my job and share her wonderfulness with me. I was so honored, i felt like i was meeting a celebrity. She was nothing but kind and had plenty of kisses to share. By far the sweetest dog I’ve ever met- for any breed. What these guys are doing is amazing. 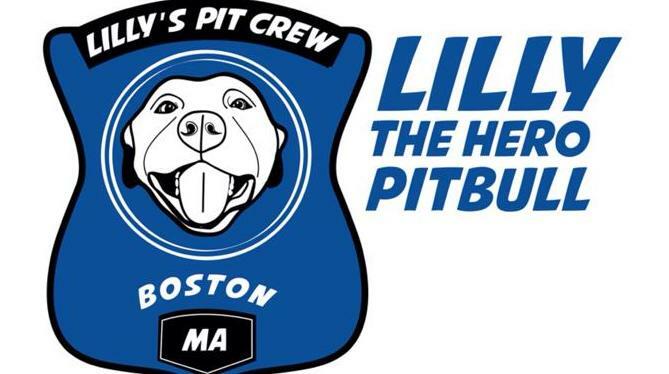 Lilly’s heroic title didn’t just end when she saved her human companion, her journey continues by making a new name for pit bulls everywhere. Thank you so much for posting pictures of Lilly with cards that some students of mine sent to Lilly. They will be soooo happy to see the picture of her with the cards they made!!! truly a reflection of heroic love. May St. Francis watch over her as she continues to recover!